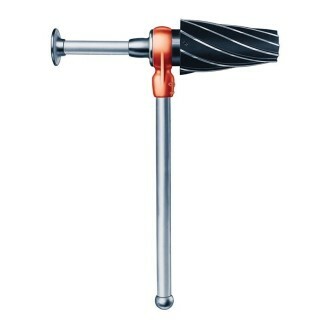 RIDGID Model 2-S ¼ -2 inch Spiral Ratchet Reamer – Self-feeding spiral design for extra-fast and easy hand reaming. Model 2-S Reamer is not suitable for power reaming. All reamers include handle. 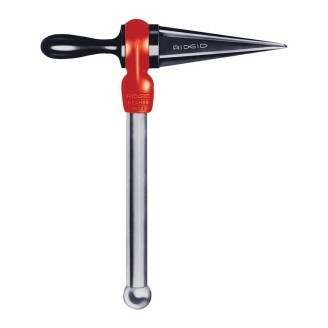 RIDGID Model 2 1/8 - 2 inch Straight Ratchet Reamer – Long taper design will not dig in. Suitable for use with power drives. All reamers include handle. RIDGID Model 3 3/8 - 3 inch Straight Ratchet Reamer – Long taper design will not dig in. Suitable for use with power drives. All reamers include handle. RIDGID Model 254 2½ - 4 inch Spiral Ratchet Reamer – Hollow center reduces weight. Large pressure plate. 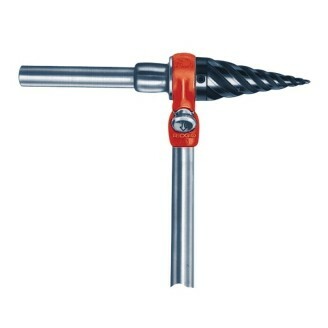 Hardened alloy steel cone removable for sharpening. Not suitable for power reaming. All reamers include handle.